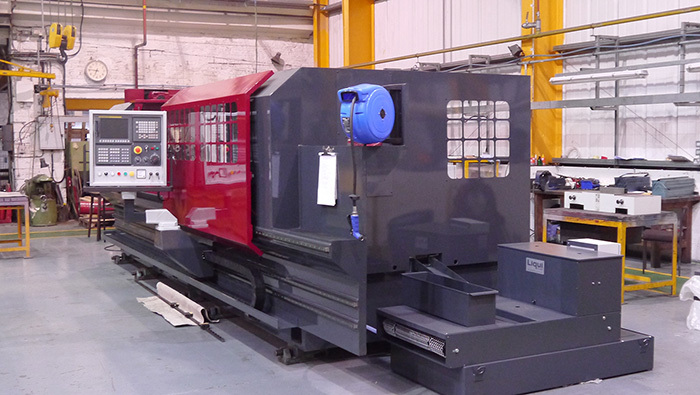 Halifax, UK based Broadbent Stanley have recently supplied and installed their ninth Yorky Type ‘O’ Oil Tool Grinder to a single customer, Smith’s Services, for their facility in Hassi Messaoud, Algeria. Capable of grinding all types of ‘down hole’ oil tools, this particular application called for the full CNC Yorky model, and will primarily be utilised for the regrinding of stabilisers up to 42” (1066mm) in diameter x 144” (3.6M) long, fishing tools, cross-over shoes and reamers. Houston based Smith’s were a world Top 500 World Company in their own right before being acquired by the giant Schlumberger Group (also Houston based) employing some 126,000 people globally. Says Broadbent Stanley Managing Director, Graham Thomas, “We are, and have been a preferred supplier to both Smith’s and Schlumberger for a number of years, and work hard at maintaining that relationship. And although the well engineered Yorky enjoys excellent reliability, mishaps do occur, and we will supply service/support anywhere in the world at a moments notice – even if it does mean one of our Technicians flying out to Texas, Nigeria or Kazakstan. The innovative, purpose designed and built Yorky Type ‘O’ is the world’s leading Oil Tool Grinder aimed by both OEM and repair shops and is available in both semi-automatic and full CNC operation, with the latter utilising the powerful, easy to use, Fanuc Oi controller. In addition to the above mentioned drilling tools, the Yorky is also capable of grinding drill pipe up to 12 metres (472”) in length along with hydroclean bars and other associated equipment.